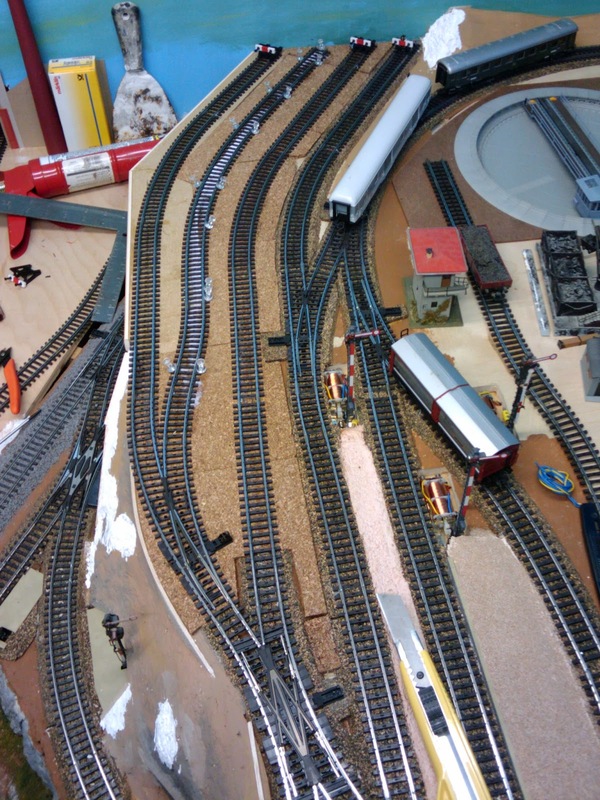 Over the last few days, I've been converting Emsingen Yard to 4 tracks. Tonight, I squeezed in the last track. In the photo below the glue is still wet. This was a a little bit tricky because there's isn't really a whole lot of space so this became an exercise of getting the track to fit right in the middle of the other two tracks. It didn't help that the masonite board I used to expand the yard to the left in above photo is too hard to get push pins in, so getting the flex track to stay in place required the help of a couple nails. Most of the trackwork in this photo is built with sectional track pieces. 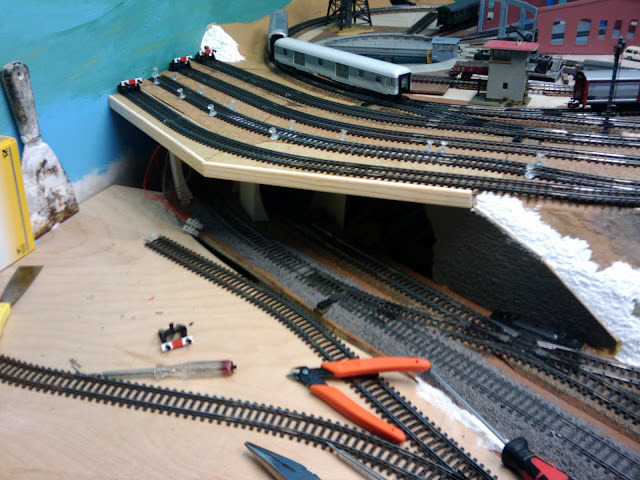 The last track installed (track 5, second from left) is mostly flextrack, and there's a short piece of flextrack next to the double-slip turnout on track 4 to get the right angle with a very slight curve. Now that trackwork on the layout is almost complete, I'm finally getting the hang of properly fitting and cutting flextrack. The Maerklin variant is quite a bit stiffer than 2 rail flextrack and thus a bit harder to work with. Since the yard is wider now, I need to redo the tunnel portal to staging, and while at it, I finished the edge all the way to the wall. I'll need to break up the bland edge with some structure, and build the supports on the left and right of the tracks underneath. But before that I need to finish and install appropriate tunnel portals, and close the wall between the double-slip and the tunnel portal.